Last October the young surveyors from Argentina had a great experience at the 5th young surveyors meeting where around 500 students participated from different states in Argentina and in this occasion some young surveyors from Uruguay participated. 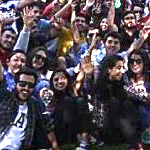 Last October the young surveyors from Argentina had a great experience at the 5th young surveyors meeting where around 500 students participated from different states in Argentina (Buenos Aires, Catamarca, Córdoba, Corrientes, Formosa, San Juan, Santa Fe, Santiago del Estero, Tucumán) and in this occasion some young surveyors from Uruguay participated. The purpose of the meeting was to exchange knowledge and experiences on new trends in scientific and technological aspects of the practice of Surveying. This meeting was held at the Rector of the National University of Littoral (UNL) Santa Fe – Argentina where the event was endorsed by the Faculty Academic Engineering and Water Sciences (FICH) and interest in the Senate of the Province of Santa Fe. The young surveyors from Argentina organize one meeting per year and they said that this year's meeting was the biggest. The students have received support from the Federation of Argentina Surveyors "FADA"; the Federation is member of FIG. 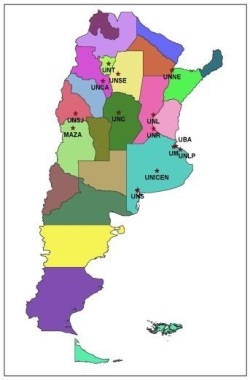 Argentina has 14 universities where they can study surveying which is very different compared to Uruguay because there they have only one. The students have one commission- CONAPEA, National Standing Committee of Surveying Students, which includes 2 surveying student representatives from each university and they now have included 2 student representatives from Uruguay. This meeting included participants from many of the regions in Argentina. In this opportunity I explained about our network in Uruguay where we have had great results and therefore now we are in communication with the Argentine young surveyors. As a result of this we hope to also participate in the 6th young surveyors Argentine meeting which it will be held in the city of Tucuman in 2016. YS from South America are active! !